It's hard to get the Stickman to go shopping. He shops out of necessity and, well, me, I shop out of the need for retail therapy! So, when he mentioned he'd like some new T-shirts, we hit the high street fast, just in case he changed his mind. My rule of thumb at TK Maxx is if you see something you like the look and the price of and it's in your size - well, it would be rude not to try it on. 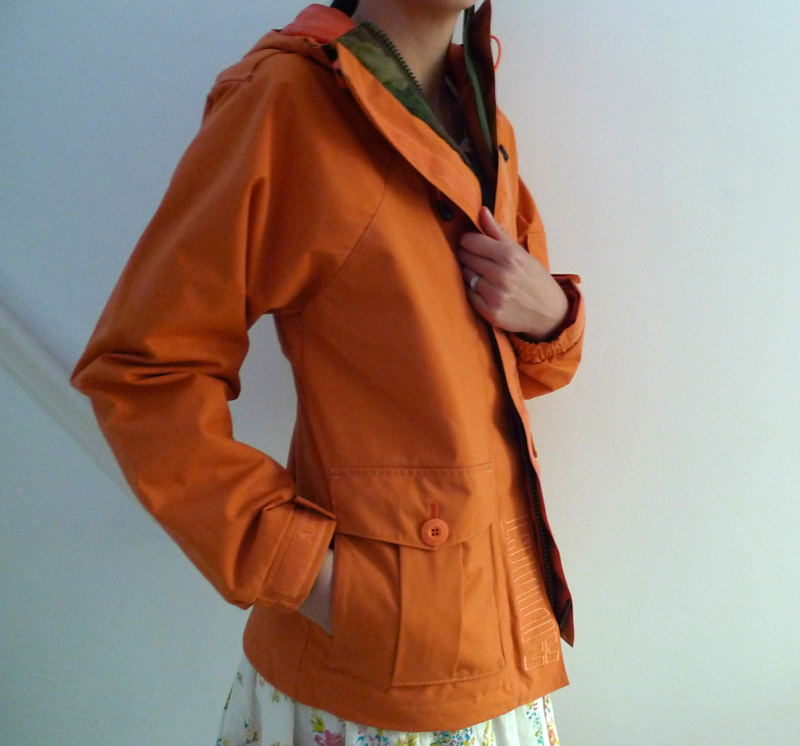 Which is how I came to be walking around the shop with a bright orange waterproof jacket. Now, I don't know about you, but I have a wish list of things I'd like or hope to find one day. And on this list is a yellow fisherman's-style raincoat that I saw Jo Whiley wearing at Glastonbury many moons ago. So, while this one by Addict isn't exactly yellow, it's a happy compromise - especially for £19.99. Practical (it's got a zip and velcro fastening, cuffs that shrink-to-fit with more velcro, double-use front pockets, a snug hood) but fun (beats a dull waterproof any day and there's even a touch of camouflage under the front fastening), it's going to be great for blustery walks on the beach with my friends and their dogs. Not sure it's going to go with my pink Hunter wellies though! I love Orange! Orange always gives a happy feeling. if you are going to wear a bright colour like this i would go all out and wear the pink hunters too!